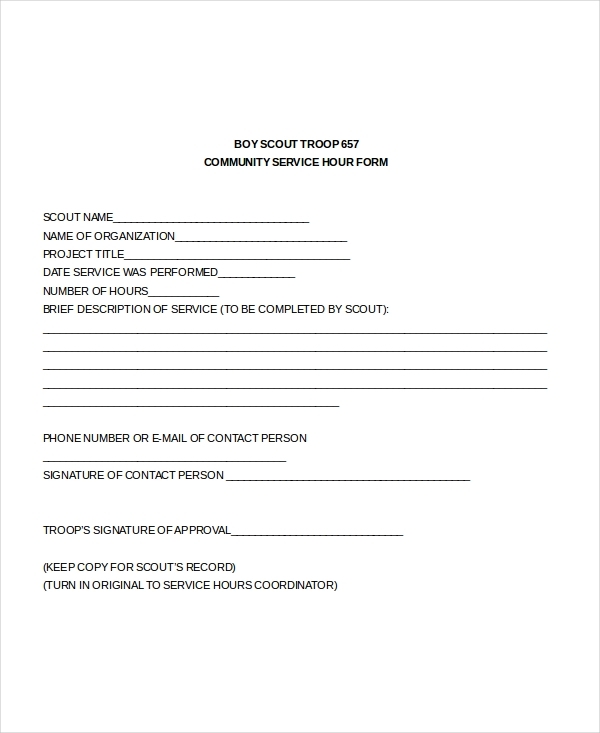 This form is used to get approval to participate in Boy Scout service hours done on troops outside prior to execution of service hours. This form can be turned to advancement chairman after completion of service. This form is not for student who is participating as member in troop activity undertaken by school-sponsored club. 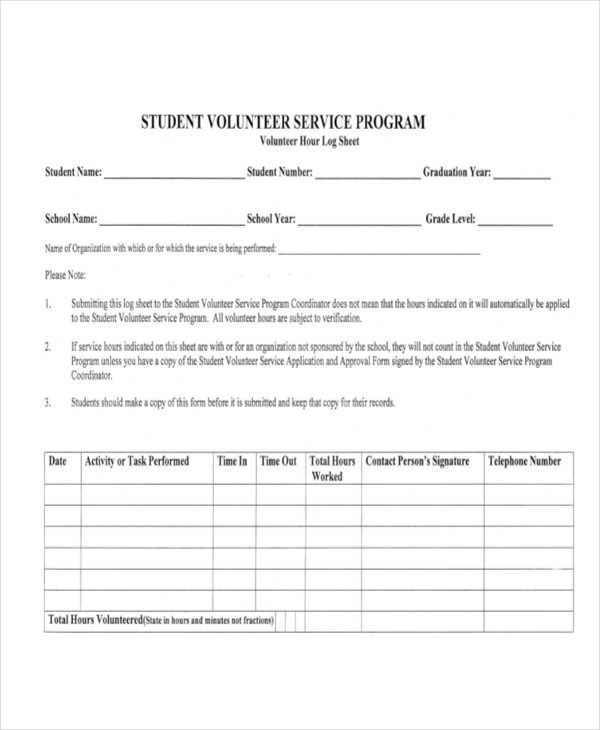 Hours indicated in this form by user will not directly be applied in Student Volunteer Service Program as all the volunteer hour needs verification. 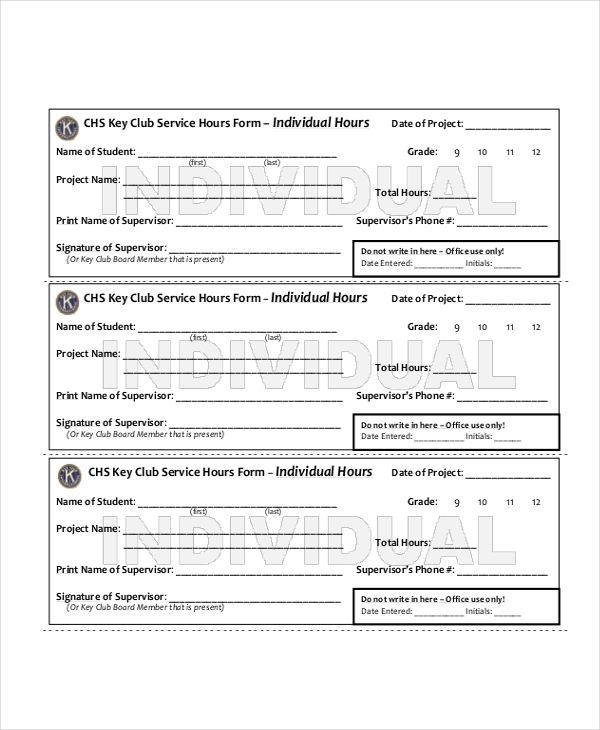 If the indicated service hours in this form are with or for unsponsored organization by the school, they won’t count in program unless they have application and approval form’s copy. 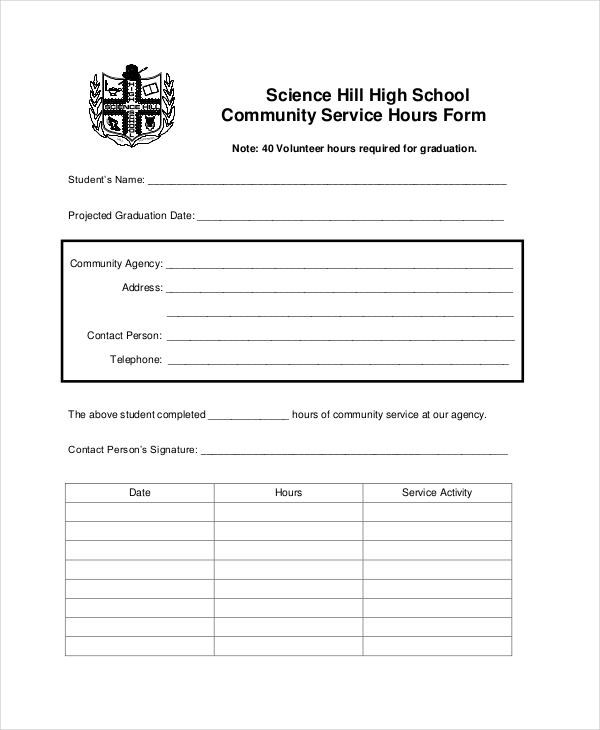 This form should be filled out completely and submitted before undertaking any service that is not connected with or sponsored by a school recognized club or organization. If a student submits this form in advance, he or she can easily check if an activity will count prior to undertaking that activity. This form must include in charge’s sign and should be filled for reporting hours. 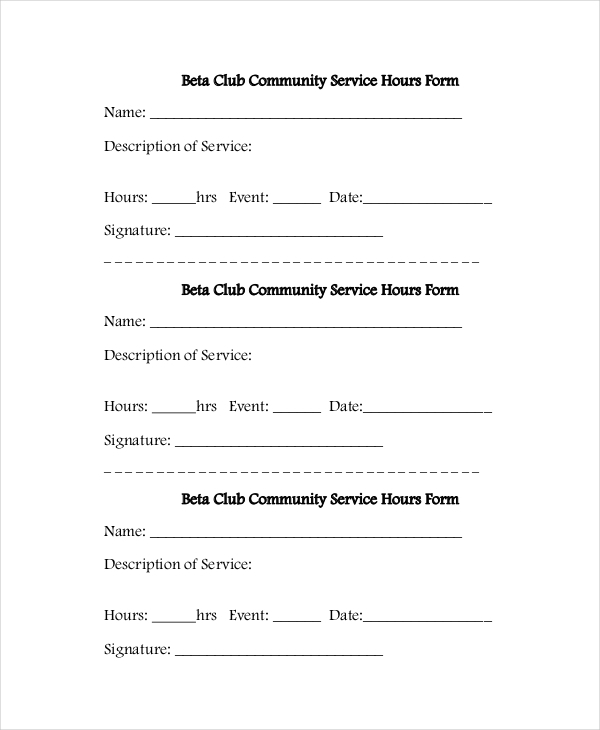 Using this form, person agrees they are expected to perform minimum 25 hrs of community service. Service performed in summer can be counted as school year’s service part. However, not every payment received for any work should be counted with community service. User should fill entirely and print this form neatly. One form should be used for every agency. If generic service is performed through school service club, then one form should be used with advisor’s sign. While recording dates, they should include day, month and year. After completing generic service, they should turn to their program coordinator. This form should be completed with every detail required. The person using this form has to provide a complete and detailed explanation of the place and work which is performed in the service hours. When they are prepared to turn in their completed service project, they are required to turn in both the pages. Keeping track of service hours is essentially important to check progress in the club, division, and the district. It is also a great way to check how much the person has served every year in total. They should make a supervisor at their service site sign their form. Every single hour counts. This form is used by parents to give permission to the person participating on the stated days and hours. They agree that they will be making a remarkable, needed and valuable contribution to their community. They have accident insurance which will cover for treatment in case of an injury while engaging in the activity. 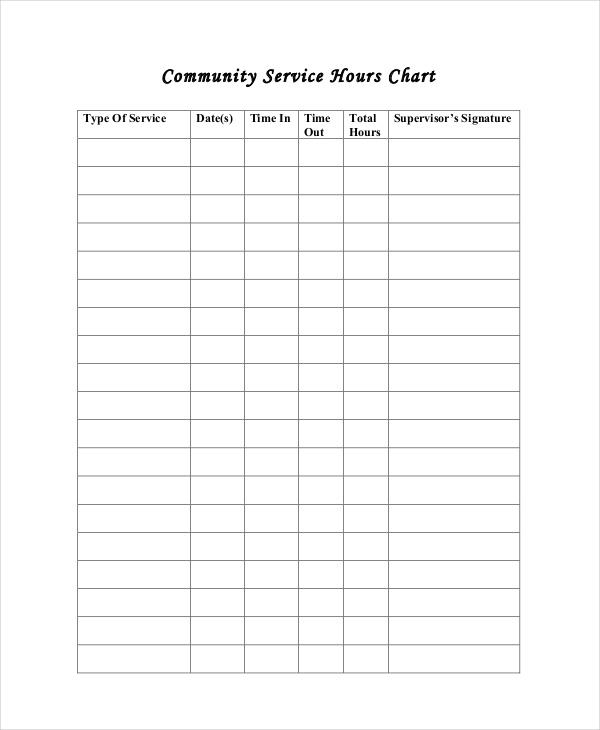 Service Hours Form is used by any individual or group of people who participate in a not-for-pay community service for the public or its institution’s benefit. It can be mandated by schools to meet the needs of a class or to meet the needs of graduation. A student cannot be paid for their service in order to receive service hours on the political campaign. They also agree that they will not receive any monetary compensation for their services. They are not eligible to collect service learning hours for political campaign volunteering for school board elections or employee. Neither are they eligible to collect service learning hours for being engaged or campaigning in the political activities on school campuses or during school day. By using this form, the students participate in such services at least for 25 hours each year. Hence, they will surely learn to visit the sick, feed the hungry and clothe the naked in their journey. They will additionally learn to give a glass of water to the thirsty, provide shelter to the homeless and visit the imprisoned as they get more inspired with their work. Even their friends and people who will find about it will expectedly join them in political campaigns. They will learn about services related with justice for adults who are working and living in poverty. They will additionally learn about service related with justice for elderly and sick. Service hours allow them to meet a broad variety of people from all walks of life. One should apply for this form in order to gain new experiences and insights. Service hours allow students to participate in new activities to develop social, technical, and academic skills which couldn’t be taught in a classroom environment. Whether they are helping out at their local street or tutoring the underprivileged children, it allows them to experience various environments and situations. Service hours bring out new hobbies, interests, and opinions. In the process they learn to give back and Help Others brighten lives. They will create better environments and healthier communities for others. They will Create Connections with People without differentiating between their age, gender, or class. They will learn positive character traits that their potential employers and admissions officers will like to see. There was a time when the students participating government sponsored services used to search for forms for Service hours to get approval to provide services. But, this service hours form is now available, for any student providing service, online in different formats. Some students doubt authenticities of easy-to-use forms; but, these online forms are absolutely error free. The students can use these forms which are available on this website for a quick and easy approval for their service. By using this form, the students will gain a Sense of Accomplishment. This form can be downloaded from this website. They can print these forms or save and then complete using Adobe Acrobat. After using Acrobat, they can save and print a form copy to turn in. This form can be used by students who performed at music camps or non-profit athletic on staff for no financial compensation. 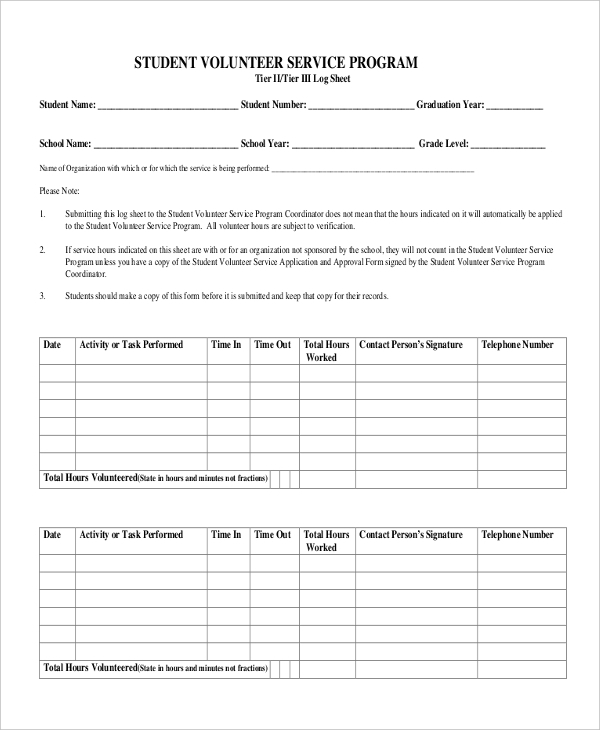 Students should make this form copy before submitting in order to keep the copy for their own records. Students should record all their hours in this form; however, they should never re-submit same hours.